Intel introduced the 486 in 1989, 24 years ago so it may be a bit surprising to see a 486 with the more modern Intel non-‘dropped e’ logo. 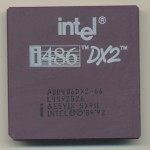 Intel began using the current logo in 2006, well after the height of the 486 market. However Intel continued to make several 486 processors clear up through 2007. These went to supply many embedded applications (medical, industrial, etc) that had originally been designed with a 486 and remained in production. These types of devices either did not need a better processor or due to regulatory reasons, could not use one. This is actually a common issue with medical devices, once designed, they are certified by the FDA (in the US, other agencies in the EU, Canada etc). This certification is very specific to that exact hardware. Often you cannot even change the S-spec/revision of the processor. If it was built/certified with an SX911 A80486DX2-66 that’s what it must continue to use. Re-certification is very expensive and time consuming. It may seem overkill but these type of applications are often life sustaining, a failure could mean more then a reboot and lost game of Doom. This is why Intel (and other companies) will choose a few products out of each line to be long-term production, this helps engineers select a product to design into their device, that has a guaranteed production life. Currently Intel’s long term products guarantee a 7-year production. This particular chip was made in April 2007. Intel announced it would be discontinued by the end of 2007 so this is truly one of the last (Intel) 486s ever made. It is a SX911 &E5V2X version which is an SL Enhance (&E) 5 Volt Mobile (2X) processor. The 2X means that the processor requires 2 external clocks, typically one would be used for when a laptop was plugged in (full speed, 33MHz in this case) and a second, which could be anything lower, for battery operation. Obviously these can be implemented in any application, not just a laptop. Registers contents, interrupts etc are all preserved when the processor switches clock frequency so this is done on the fly, just like today’s processors. The SX911 spec, which first was released in 1994, came in both 1X (desktop) and 2X (mobile) versions. Throughout its 13 years of production it remained on a 150mm (6-inch) wafer process at 0.8u. In a very strange coincidence, I actually have this chip in my VERY SMALL collection of only 6 processors. I have just started collecting them. You seem to have a lot of information based off of the #’s on your CPU. My question is, what do the model #’s mean on my chip? &E5V1X is an SL Enhanced (&E) 5 Volt Desktop (1X) processor. Assembled in the USA on week 40 of 1994 (C4400142) SX807 is the specification which has the same CPUID as a SX911 so should be relatively the same. I’ve been hunting on Ebay for some DX2 CPUs and found a source, but have some questions that I hope you can help with. 2 different models (SX626 and SX641). Can you explain what the different specifications might be? There is also NO “&5v1x” indication, just the SX specification, is this something I have to worry about? I found out they have different CPUIDs, 432 for SX626 & 433 for SX641. Is the CPUID just a manufacturing date code? Both CPUs do not support SL features. Can you explain what that is? Its a mask revision, either for a bug (errata) fix, or more often, a change to improve production yields/speeds. SL features are for power management (add different power down modes) They are not needed for most uses. Since Intel uses only a single digit for years in their datecodes, how would you tell that 2004 DX2 apart from a 1994 manufactured one? You don’t always,, though usually you can tell by the markings as they slowly have evolved. Intel did start adding a letter to the FPO that helps in this case L2707A11. A letter there (usually A or B) always indicates later production then no letter. Yeah on the 2007 chip it is clear from the new logo and perhaps the white markings, but on the supposed 2004 one I don’t see any hints. L4492526 could mean either week 49 of 1994 or 2004. Pretty weak system compared to the usual datecode format on chips, though maybe they didn’t anticipate themselves that these models would be produced for such a long time.